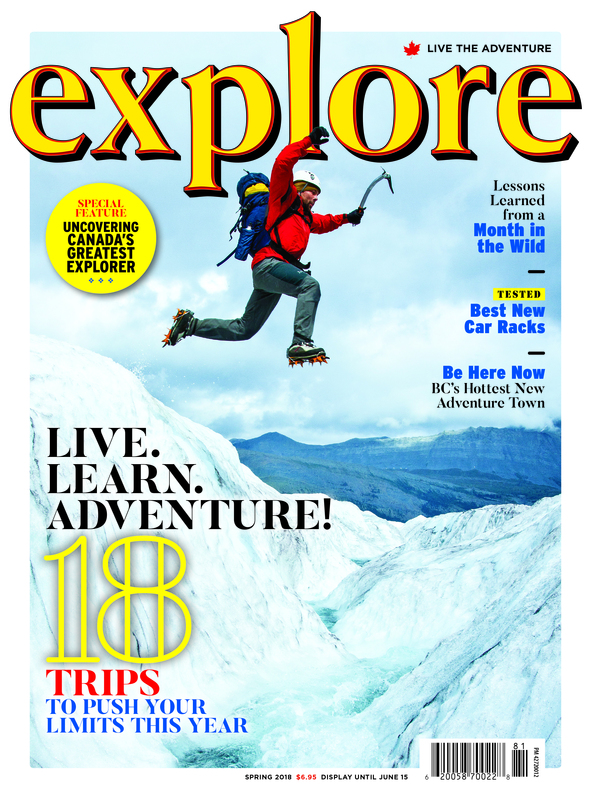 Welcome to your year of adventure in Canada—with 52 amazing and unique experiences! How many will you check off in 2019? From coast-to-coast, we have adventures ranging from rich cultural experiences in the outdoors, to wildlife viewing, to extreme backcountry trips, paddling destinations and so much more. Canada is an outdoor-lover's paradise with infinite possibilities. Let's make 2019 epic. 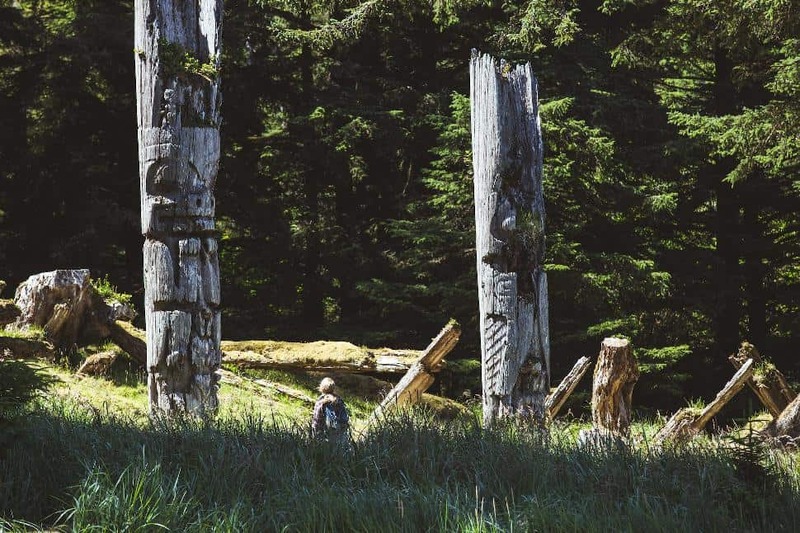 Known to the Haida people as Xhaaidlagha Gwaayaai—the “Islands at the Edge of the World”—the archipelago of Haida Gwaii feels every bit that. And perhaps nowhere embodies this misty, moody, remote feeling more than Gwaii Haanas National Park Reserve, National Marine Conservation Area and Haida Heritage Site. Located at the southern tip of Haida Gwaii, this area is usually powerboat or plane-access (though you can paddle in if you’re an experienced tripper). Meet the Haida Watchmen and learn their stories. Marvel at the mortuary poles as they return to the Earth. 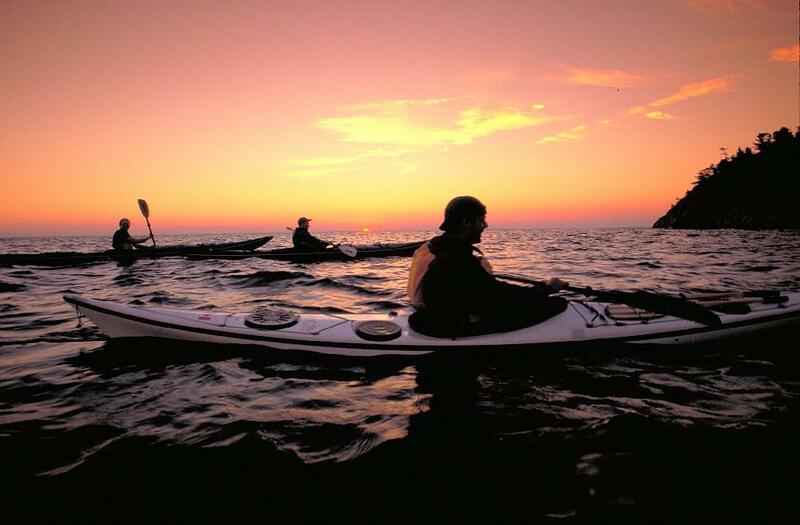 Kayak in the realm of salmon, whales and sea lions. The magic will remain with you long after you return. Squamish has everything the outdoors-person could want—hiking, skiing, birdwatching, mountain biking... there are very good reasons it’s dubbed “The Outdoor Recreation Capital of Canada.” But these are generally seasonal activities. There is one thing it has all the time, however—wind. 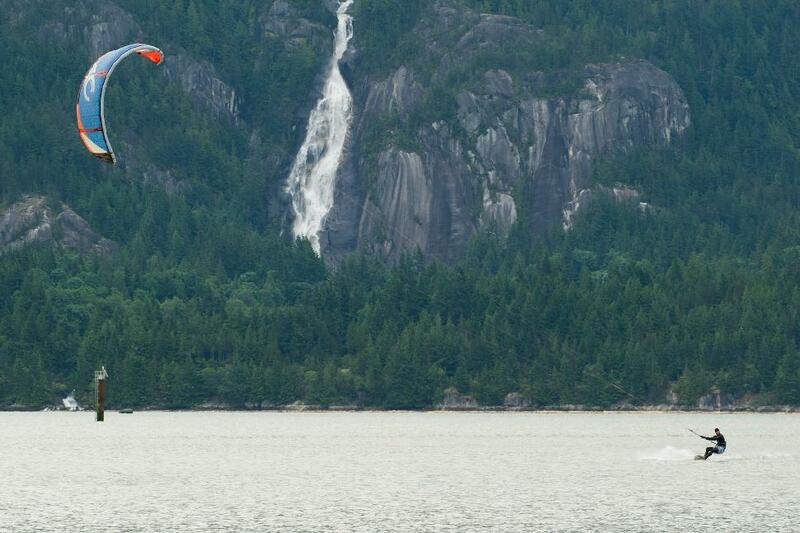 Reliable breezes blow down Howe Sound and over the Squamish Spit, making it one of the best windsports locales on Earth. While it’s suitable for the seasoned pro, several operators in-town will turn you from nervous newbie to kite-surfer in just one weekend. In British Columbia, Squamish tends to garner all the press for rock climbing—one look at the imposing granite monolith looming over town and you’ll see why. But beginners may be better off to head for Skaha Bluffs, near Penticton. It’s drier, warmer and usually sunnier. While there are routes for pros, newbies can head to the classic climbs at “Day Care” and literally learn the ropes. Local guides will have just about anyone climbing in a matter of minutes—the gateway drug to one of the most addictive of all outdoor sports. Located north of Kamloops, Wells Gray Provincial Park is one of the province’s lesser-known gems. It’s wild and rugged, with more than half-a-million hectares of serene lakes, high alpine, flowery meadows, raging rivers and dense woods. And it’s a waterfall hunter’s dream. 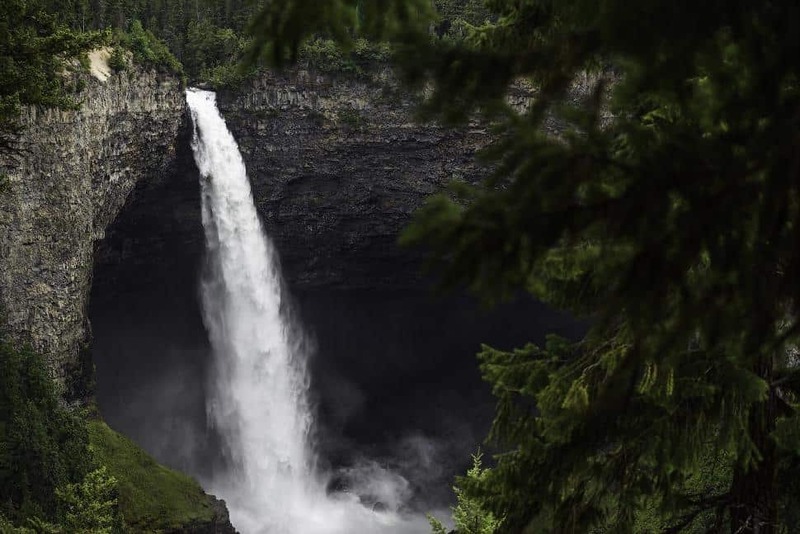 Most will head for impressive Helmcken Falls, a 141-metre-tall torrent that formed part of the basis for the park’s creation. But real waterfall hunters should trek the six kilometres to Moul Falls—it’s the only cascade in the park that you can actually walk behind. Set in the northwestern corner of British Columbia, the Sacred Headwaters are not easy to get to. And ideally, the source of the Nass, Skeena and Stikine rivers will remain that way. This place, the birthplace of the world in First Nations mythology, is a land of abundance and vitality—its beauty cannot be overstated. It’s also threatened by resource extraction. Horseback trips are a popular and low-impact way to see this wilderness region, though some intrepid folk have backpacked and pack-rafted into it on their own. Let the tourists flock to Banff and Jasper. You’re headed to British Columbia’s Northern Rockies—an area near the town of Fort Nelson that is every bit as gorgeous as the popular mountain national parks, but with a fraction of the visitors. Try a classic easy hike like Mineral Licks Trail in Muncho Lake Provincial Park, or head into Northern Rocky Mountains Provincial Park for challenging multi-day routes like McDonald Creek Valley and Wokkpash Valley- McDonald Creek Loop trails. Looming nearly 2,000 metres above the tiny town of Golden, Mount 7 is a recreationists’ hot spot. Biking and hiking, yes, but most of all—flying. Reliable (sometimes very strong) winds, thermals, easy access to launch sites and spectacular scenery make it a draw for paragliders and hang-gliders the world-round. But you can do it too—by booking a tandem flight with one of the many local operators. 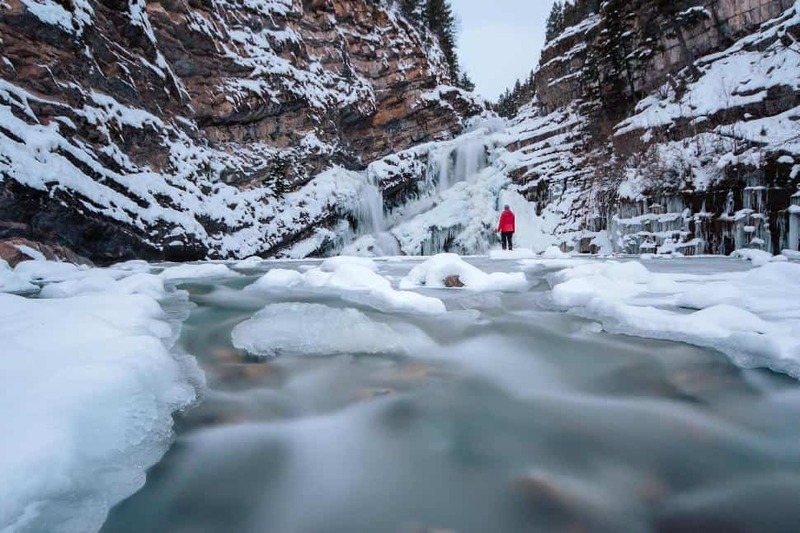 Everybody knows Waterton Lakes National Park is a Rocky Mountain gem—but few know its prime season might be winter. With the village mostly shut down, visitorship is minimal. Snowfall coats the Crown of the Continent environs, begging you to spend days skiing, snowshoeing, birdwatching, ice-skating and more. Wildlife is particularly active, so bring your telephoto lens. Only two hotels and two restaurants are open (check before you travel). It’s serenity at its finest. *Check updates for closed/restricted areas due to 2017 fire. Even though it’s only about five kilometres from its trailhead at the Fairmont Chateau Lake Louise, the trail up Devil’s Thumb should not be underestimated. It’s a steep, sweaty, crumbly and often exposed climb to the summit of this promontory—more of a scramble than a hike. However, the view from atop emerald Lake Louise and neighbouring Lake Agnes and over the ragged waves of Rocky Mountains is well worth the effort. 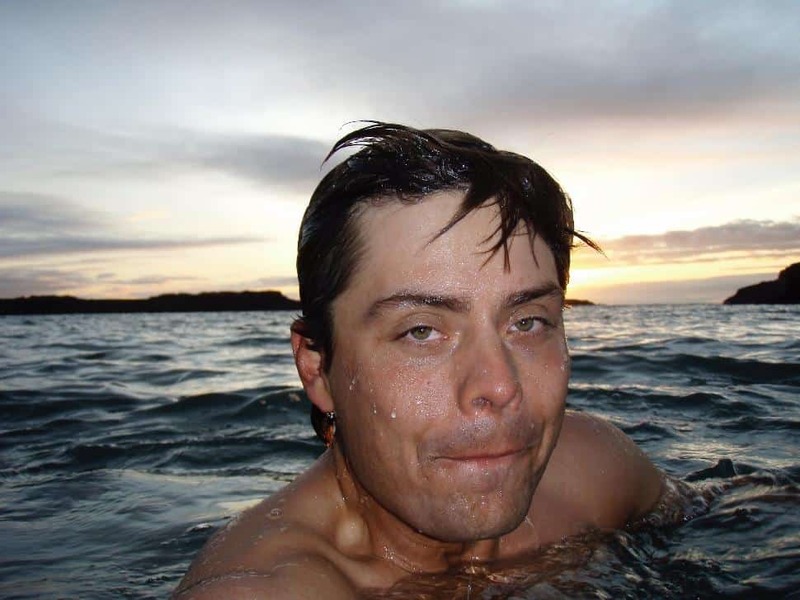 It’s easy to sneer at tourists taking selfies next to Canada’s most stunning natural monuments. 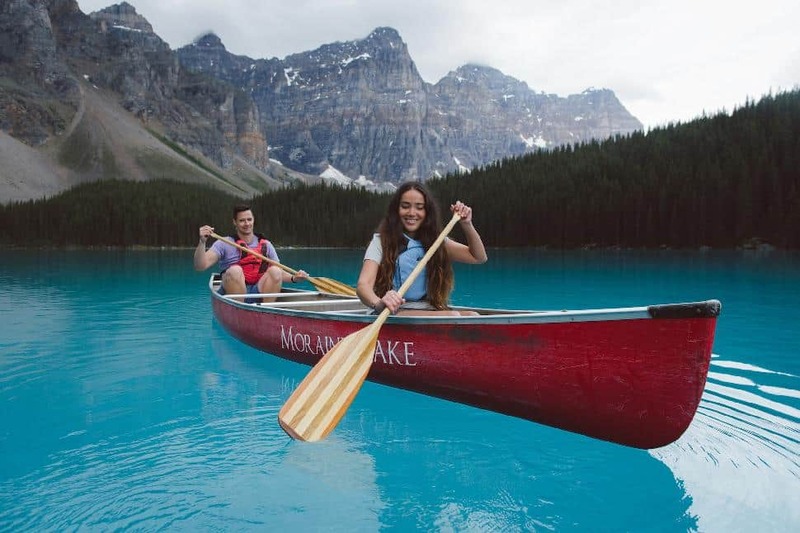 “Can’t they just enjoy the moment...?” Well, we challenge you not to take a selfie at Moraine Lake, in Banff National Park. Emerald in colour, perfectly still, surrounded by the Valley of the Ten Peaks and rimmed with evergreen trees, Moraine Lake is so perfectly picturesque it’s hard to believe it’s real. (Head there in late June for the most vibrant water colour.) So enjoy the moment. Then snap a selfie—we forgive you. 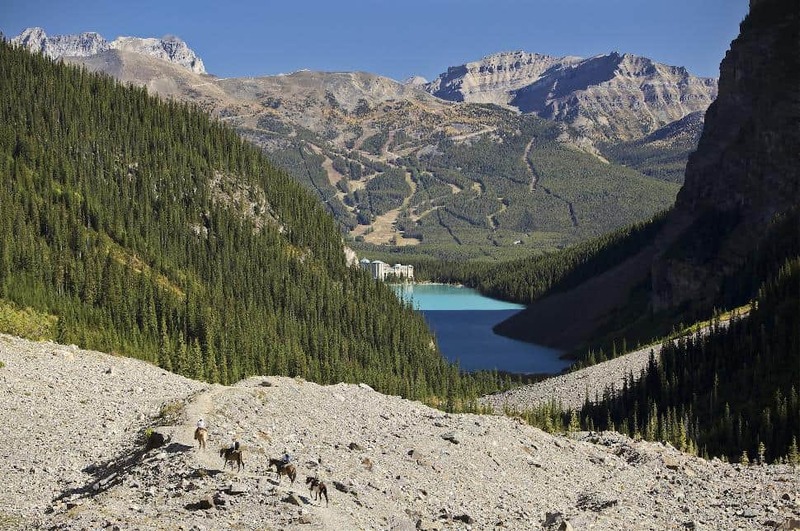 Just like with Devil’s Thumb, you’ll start the 12-kilometre Plain of Six Glaciers hike at the busy Fairmont Chateau Lake Louise. Then follow the emerald shoreline to the far end (where the crowds thin) to begin your climb. Switchbacks treat to monumental views over the lake, glaciers and pyramidal peaks. You may even spot a shaggy mountain goat. Reward yourself with a cuppa at Plain of Six Glaciers Teahouse at the top, and continue for an additional 1.5 kilometres to the worthy Victoria Glacier viewpoint. 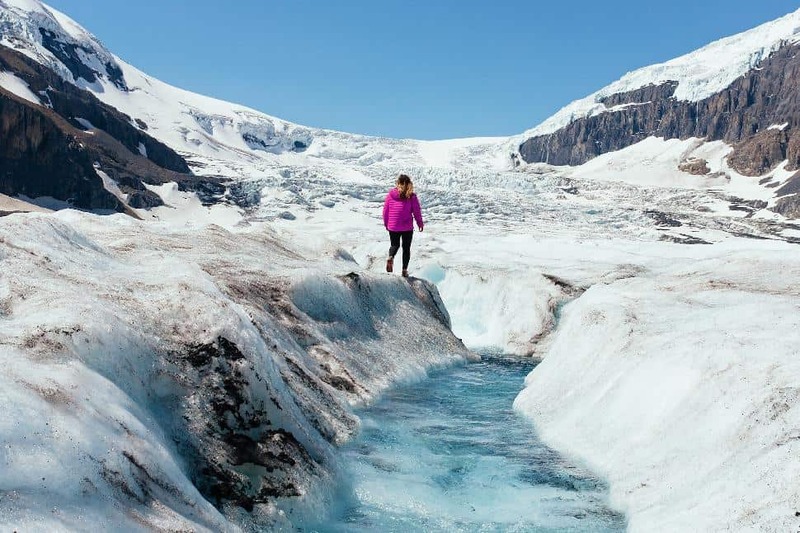 As the signature glacier of the Columbia Icefields, millions of people have gazed upon the silvery tongue of the Athabasca Glacier as it snakes towards the scenic Icefields Parkway. Thousands of guests have ridden on giant ice-climbing tour busses to get a closer look—but fewer people actually slip into crampons and go for a guided hike across the ice, learning about glaciology as they go. And that’s the best way to experience this natural wonder—hands on and up-close. Tours generally range from three hours to a full day. Think you need an ocean to go stand-up paddleboarding? Think again. 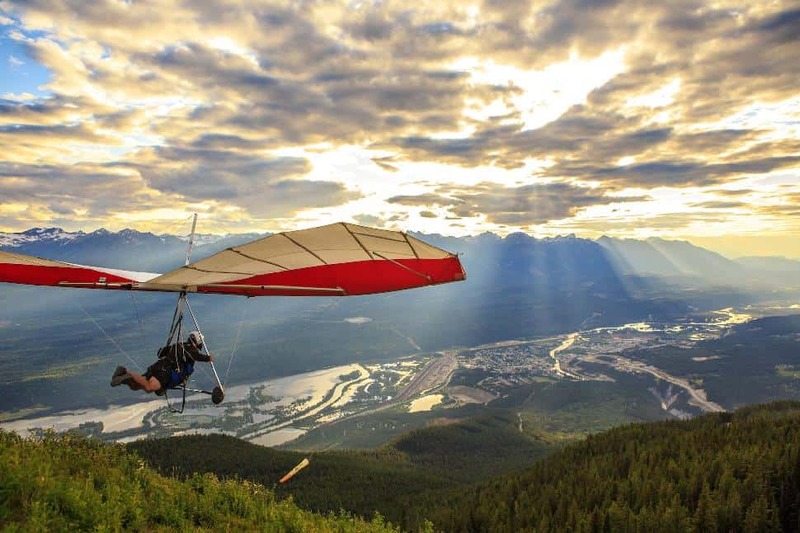 In Banff and Canmore, you can do it in the mountains. Jump on an in inflatable paddleboard and push off on a wily river trip between impressive mountains and serene forest. Dip a toe in the glacier water—it’s cold! (But in summer’s heat, you may welcome the chance to chill out post-paddle.) Start with the Bow or Kananaskis rivers, then move into Two Jack Lake or Canmore Reservoir—there are ample waters to ply. Cypress Hills is officially an “interprovincial park,” sharing land with Saskatchewan—but Elkwater, Alberta offers the best jumping off point to explore these scenic environs. With undulating topography, serene waters, mountain bike trails and winter activities, you won’t have a problem occupying your time here. 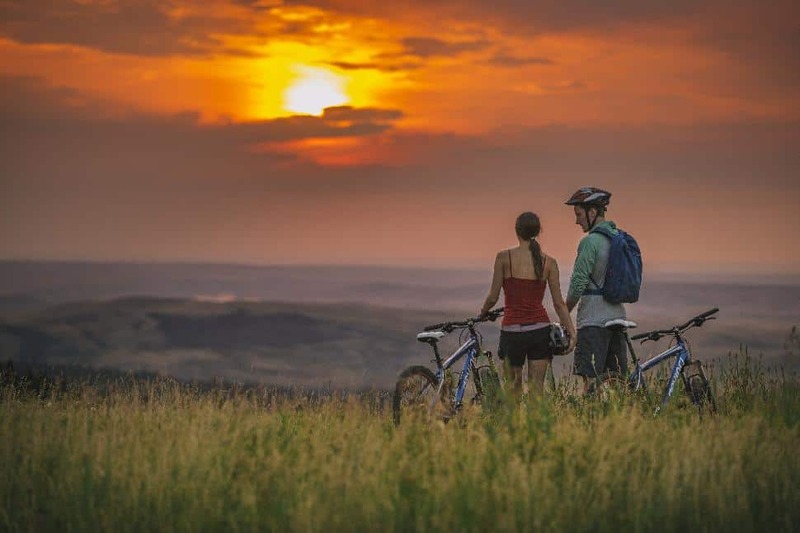 Start with a sunrise hike to the Horseshoe Canyon Viewpoint, or bring your bike to ramble through the Mystery Trail. Before you leave, track down the highest point between the Rockies and Labrador, located on the Alberta side. At 1,465 metres above sea level, it is higher than the summits of Vancouver’s North Shore ski hills. This is not the landscape you would expect to find in the boreal forest of northern Saskatchewan. In fact, you might not expect it in Canada at all. Welcome to Athabasca Sand Dunes Provincial Park—100 kilometres of ever-moving sand dunes, like a chunk of the Sahara planted near the 60th parallel. As some of the most northerly dunes in the world, and Canada’s largest (reaching 30 metres in height), the area is home to endemic species and unique scenery. It’s also hard to get to— oat plane only. And there are no services; you’ll be totally on your own. As one of Canada’s two land-locked provinces, it’s somewhat ironic that Saskatchewan would have some of the country’s best fishing. The angling’s pretty good in the southern prairies, but once you get north of Saskatoon and hit the boreal-forested lake country—home to 100,000 lakes—it gets surreal. Lake trout reaching 40 kilograms. 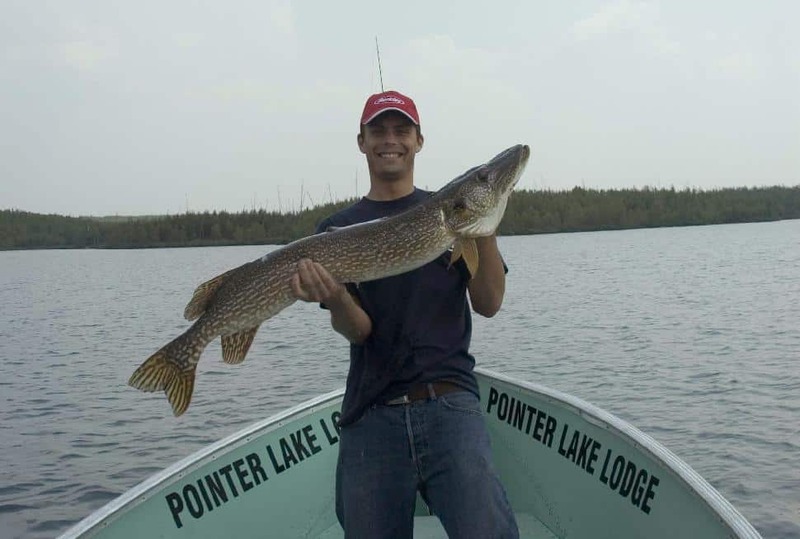 Northern pike that seem more like alligators than fish. Walleye with such abundance you’ll nearly get bored of catching them. Options abound—areas near the town of La Ronge are excellent start points. The South Saskatchewan River is one of Canada’s most serene and scenic multi-day paddling routes. For starters, it can be about as long or as short as you’d like—the river meanders halfway across Western Canada with easy put-ins along the way. 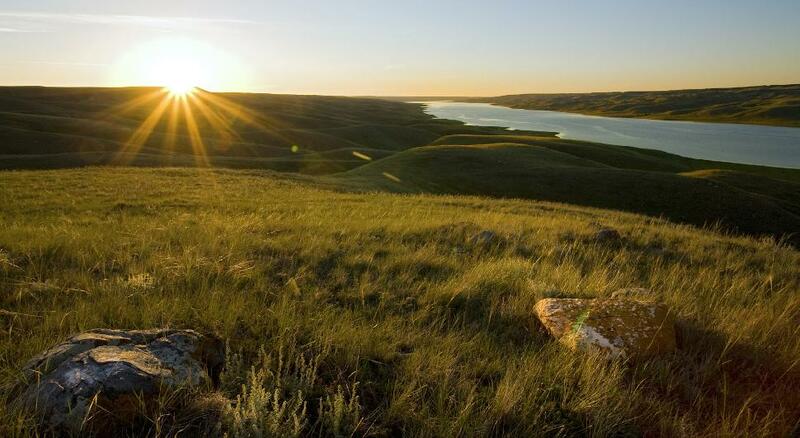 Plus, it passes cute towns, rolling prairie and ranchlands as it carves through the Great Plains. Try the 130-kilometre route from Gardiner Dam to Saskatoon for a start. Some have done it in a long weekend, but five days is better to fully revel in the experience. Lake Winnipeg is intimidating. At 24,500-square- kilometres, it’s just a little bigger than the country of Belize. It starts 55 kilometres away from Winnipeg, but reaches 416 kilometres north from there, passing deep into the boreal forest to the edge of the tundra. And it’s a kayaker and canoeist’s dream. If you’re less experienced, stick to the sandy, gentler eastern shorelines—Grand Beach Provincial Park is a nice put-in. Or, hit the west side at Hecla-Grindstone Provincial Park to island-hop. Or head way out to Grand Rapids for wild and remote multi-day routes in the lake’s northern reaches. 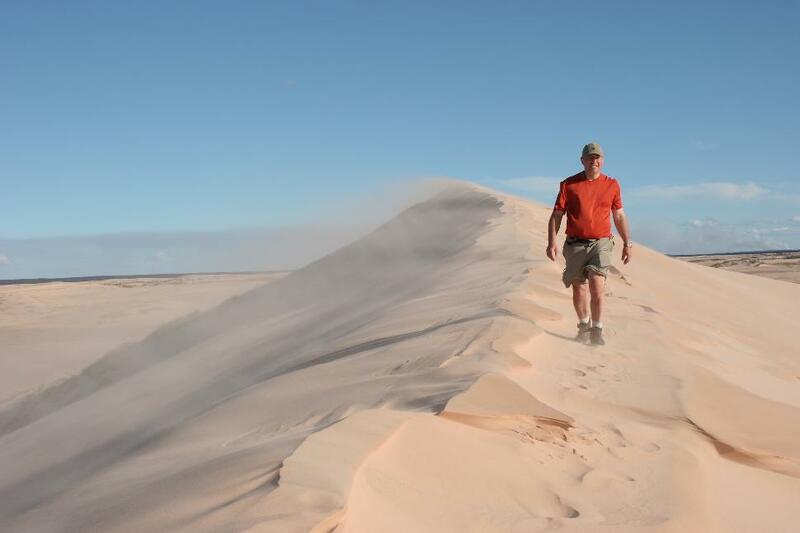 You’ll come face-to-face with 30-metre sand dunes, but this is no desert—400 millimetres of annual rainfall sees to that. 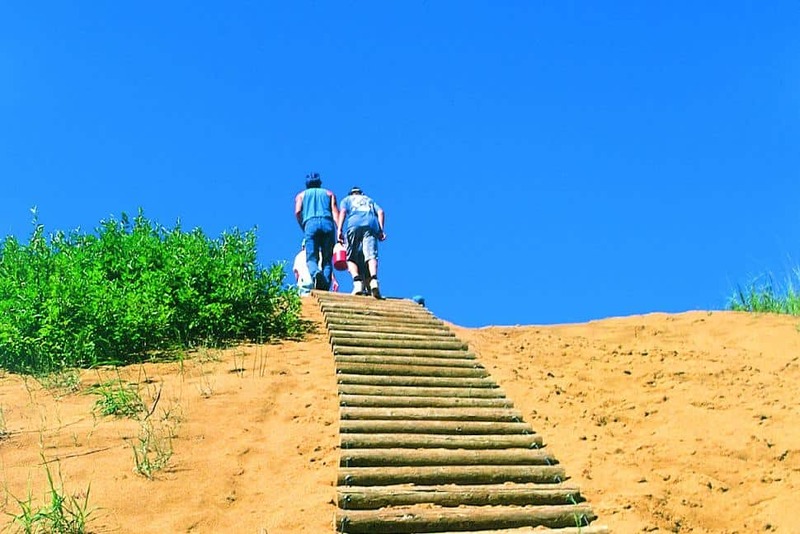 Nevertheless, the Sahara-like terrain of Spirit Sands, located in Spruce Woods Provincial Park, about two hours west of Winnipeg, offers two- to 3.5-hour hiking routes with spectacular payoffs. From the trailhead at Seton Bridge, take either a three- or 5.5-kilometre trail through shifting sands, ever encroached on by forest and rich with cacti, en route to the Devil’s Punch Bowl, a 45-metre depression containing an ethereal blue-green pool. 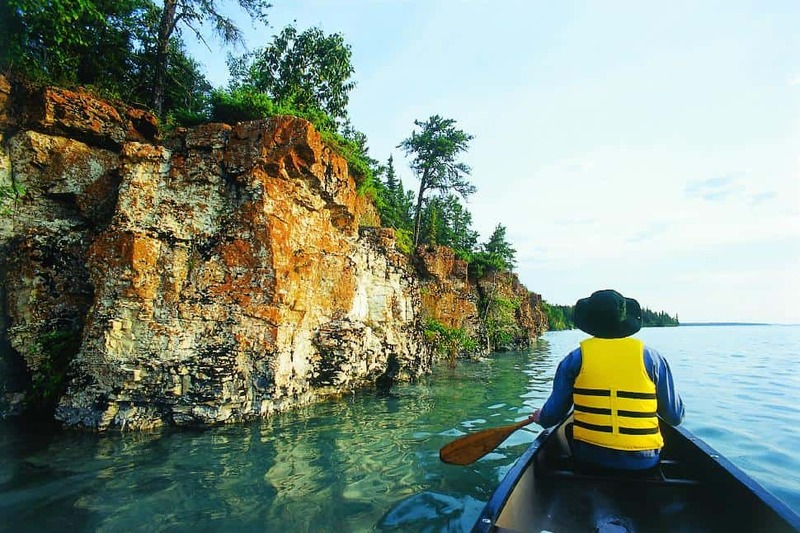 One of Ontario’s most remote and renowned provincial parks, Wabakimi beckons the outdoor adventurer. Nearly 900,000 hectares of boat- or plane-access wilderness with some 2,000 kilometres of paddling routes and more than 500 backcountry campsites await. 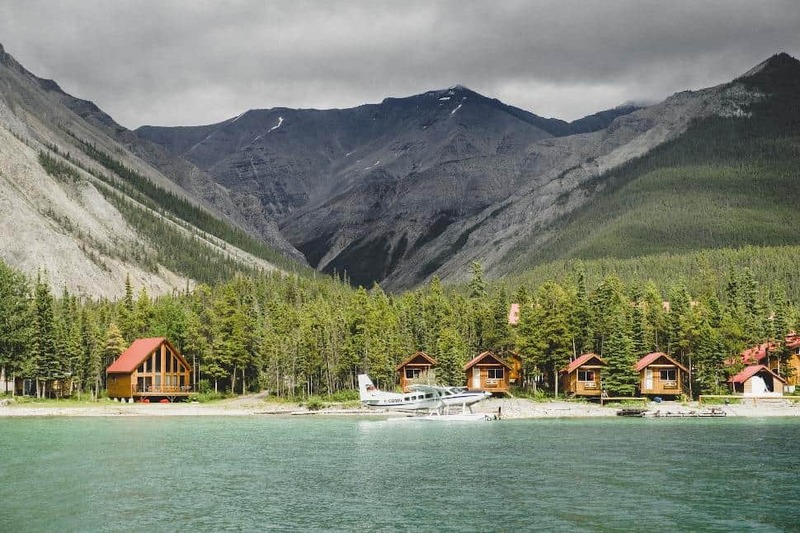 There are lodges speckled throughout the park, but intrepid folk book a fly-in drop-off and spend a week or more meandering through these ample and serene lakes and rivers. Fish for bass and pike; swim in warm waters; enjoy the Canadian backcountry. Ontario is rich with canoeing opportunities. 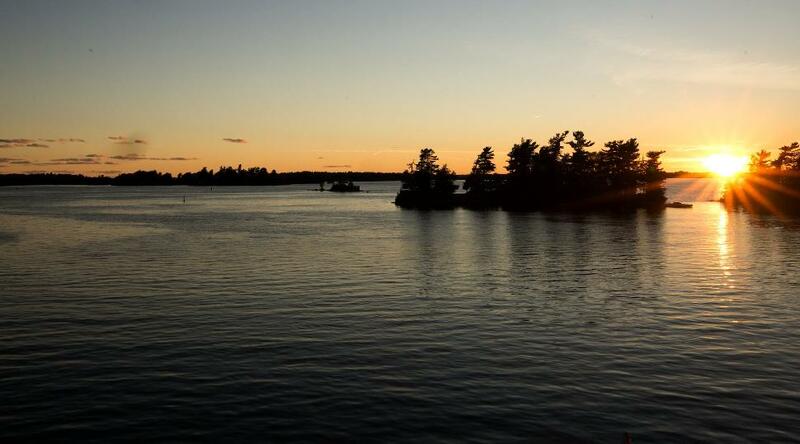 So why does Quetico Provincial Park stand out? Two things: easy access and a relative lack of portages. Located just a couple hours west of Thunder Bay, it’s simple to find a jumping-off point into this backcountry park. 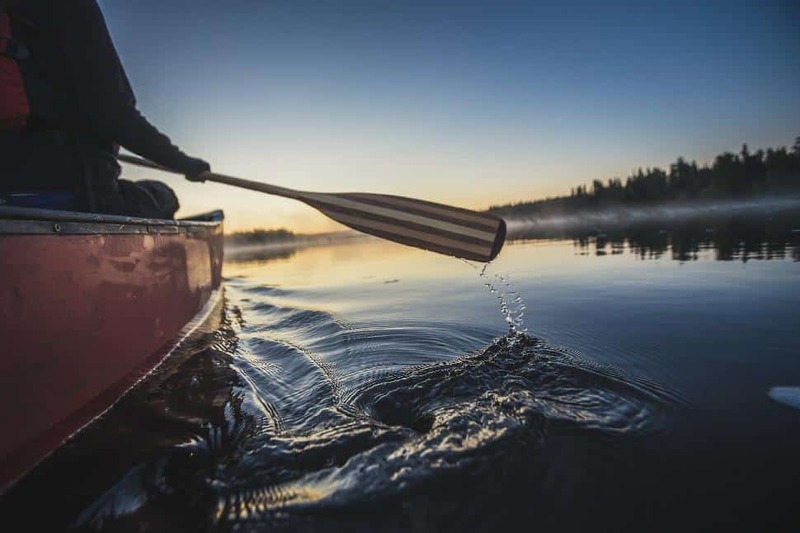 And while you’ll find portages throughout, you can easily canoe for a couple days or more without having to hump your canoe through a (well maintained) trail. Looking for a route? Try Beaverhouse Ranger Station or Falls Chain Loop to start—but paddling adventures are limitless in this canoeing mecca. If you were to choose only one adventure in Sleeping Giant Provincial Park—head for the Top of the Giant. After a lengthy lakeside stroll followed by a stout climb, you’ll be rewarded with a series of impressive vistas looking both west and east over Lake Superior, culminating with the step-stones of the Giant’s Knees. Here, after tracing a rocky ridge that’s said to resemble, well, a “sleeping giant,” the trail ends abruptly at a terrifying gorge where sheer granite cliffs plunge 200 metres toward the forested shoreline of Lake Superior before tumbling another 90 metres into the massive lake, with Thunder Bay in the distance. You’ll have to sweat for this prize—the return length from Kabeyun South Trailhead is 22 kilometres. Lake Superior behaves more like an ocean than a lake. It’s wild, unpredictable and massive. Storms can come out of nowhere and vast tracts of its northern shoreline are empty and distant from human interference. For experienced kayakers, these are reasons to paddle it—not reasons to stay away. Paddlers can challenge themselves on the Coastal Kayak/Canoe Route, which runs roughly along the famed Coastal Trail hiking path. 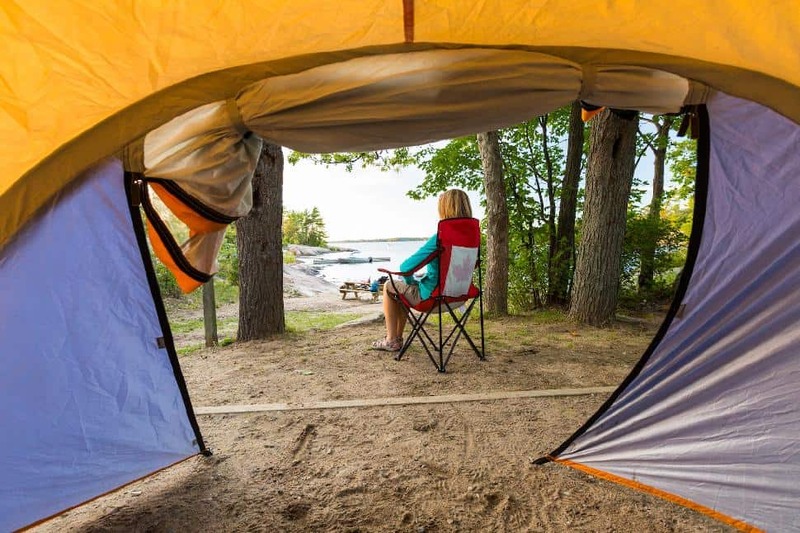 More than 100 kilometres of ragged shoreline awaits, with scenic campsites dotted along the route. It’ll take you a week—but it’ll be a week to remember. 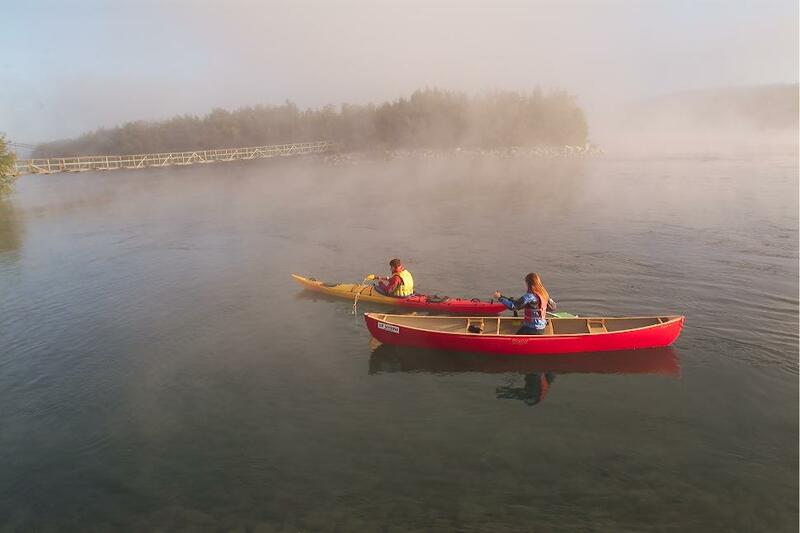 More than 20 granite islands invite paddlers into Thousand Islands National Park, located in the St. Lawrence River. Novice canoeists and kayakers may paddle with a guide; the experienced will set out independently. However you choose to explore, you’ll be awe- inspired as you cruise past the sand beaches of Thwartway Island, the unique rock formations of Mermaid Island or Beau Rivage’s granite shores. Stop for a walk on Mulcaster Island. Then camp under the stars and continue your Thousand Islands adventure the next day. Welcome to the world’s largest freshwater archipelago—where Beausoleil Island, in Georgian Bay Islands National Park, offers a campsite for everyone. After cruising to the island via passenger ferry, you can choose to spend a few nights in comfort at one of the six family cabins at Cedar Spring or the more rustic couples’ cabins on Christian Beach, or pitch a tent nearby. More adventurous folks will carry their packs to the windswept northern reaches of Beausoleil to camp on the Canadian Shield rocks, spending days hiking marked trails, swimming in warm waters or exploring nearby islets via kayak or canoe. Located near Tobermory, Fathom Five National Marine Park hosts some truly impressive above-water features. Flowerpot Rocks seem manifested from a Dr. Seuss tale. Lush woodland lines scenic limestone cliffs. And if you’re lucky enough to secure a campsite, the stargazing is second-to-none. 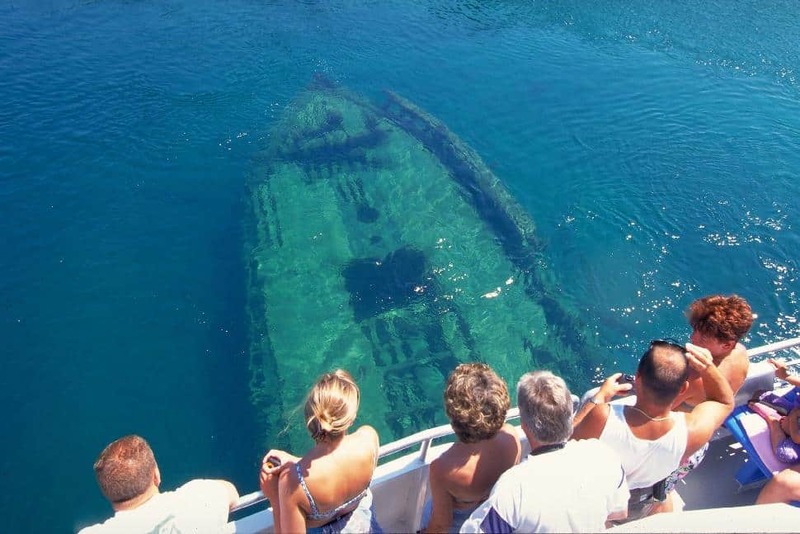 But the real treats lie below the surface: 22 shipwrecks (some snorkel accessible), submerged petrified forests, unique dolomite formations, underwater caverns and more. Whether you swim, snorkel or don scuba gear—Fathom Five will impress. 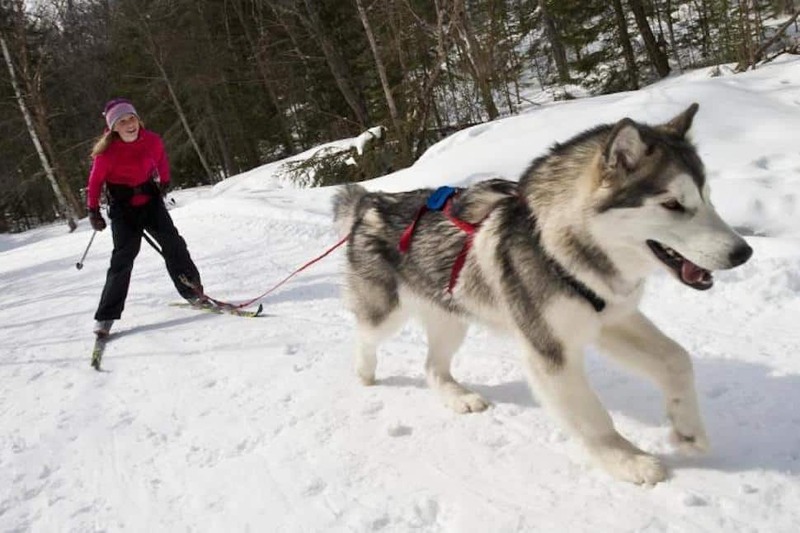 Pack your pup and drive a couple hours’ north of Toronto to Arrowhead Provincial Park for a skijoring lesson with sports clinicians Lowell Greib and Katherine Ahokas of Huntsville’s The SportLab. Skijoring is like dogsledding—except on cross-country skis—and it’s a great workout for both you and Fido. Sunday afternoon clinics are held weekly during winter on Arrowhead’s three-kilometre-long cross-country trail. If you still have energy afterwards, trade skis for skates and finish your day with a few laps through the park’s forested skating trail. When you think of surfing, you think of Montreal, right? Well, maybe not—but you should. 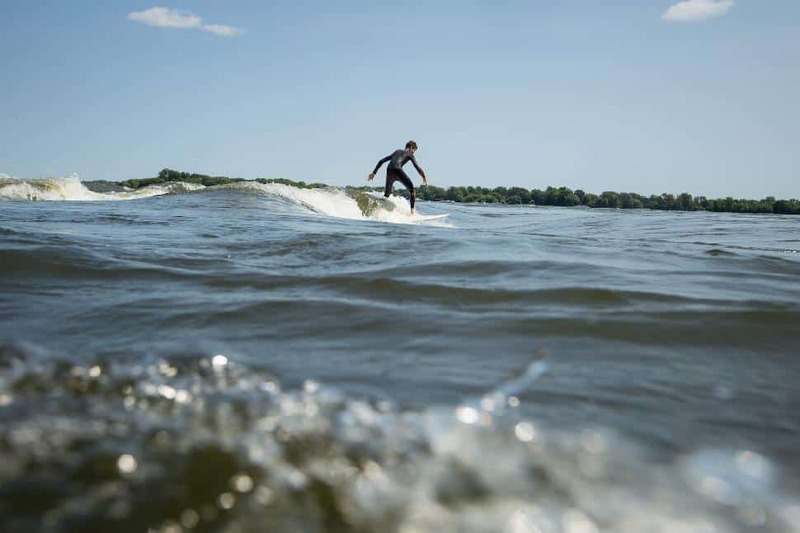 Located right in front of the oddball futurist Habitat 67 building on the rushing St. Lawrence River is a phenomenon called a “standing wave.” If you’re a skilled surfer and a strong swimmer, paddle out, catch this wave and surf it for as long as you can— often several minutes or more. The surf season generally runs from about April to November, with thicker wetsuits required at the seasonal bookends. 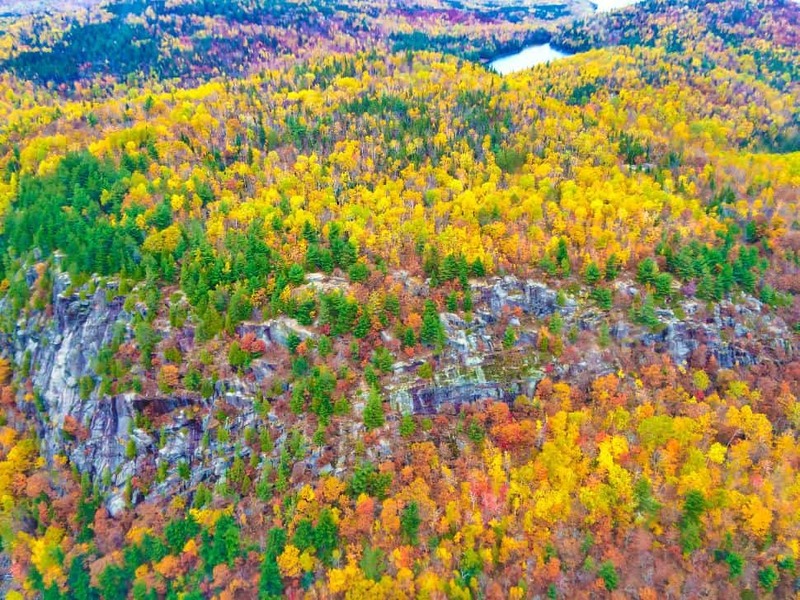 Come autumn, Quebec’s La Mauricie National Park, near Shawinigan, is an explosion of vibrant reds, oranges, yellows and gold—and Deux-Criques (Two Creeks) Trail could offer up some of the best views of all the Laurentians. A challenging day-hike suitable for trekkers with strong cardio and a willingness to climb, the trailhead is located near Riviere a la Peche Campground and will take you on an uphill march for the next 8.5 kilometres. Expect some well-maintained stairs and scramble-worthy rock sections and you’ll have to ford a creek (which is at its lowest in fall)—but the payoff is multiple lookout points, including Ruisseau de Fou Falls. 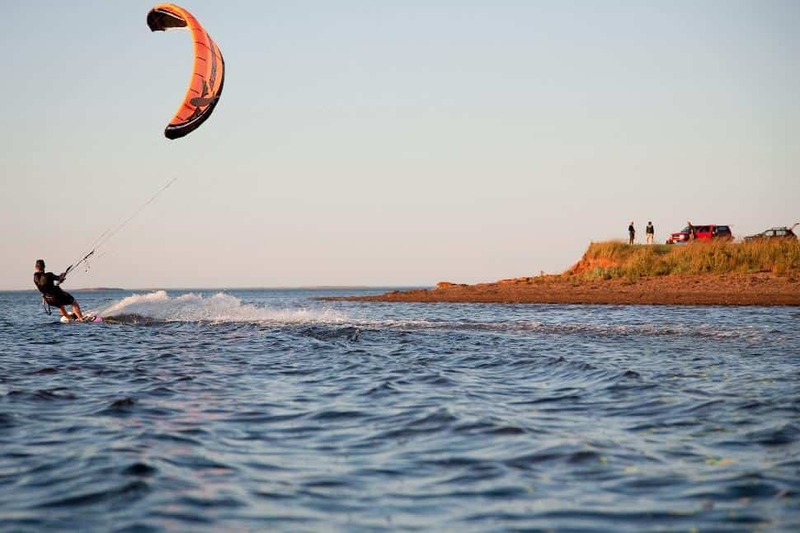 Located in the middle of the Gulf of St. Lawrence, rimmed by white-sand beaches and red cliffs, the archipelago of Îles de la Madeleine exerts a magnetic attraction on visitors. Cycling circuits weave through the islands—try the 58-kilometre route on the Eastern Islands (Pointe aux Loups, Grosse Île and Grande Entrée). This paved route follows the shoreline so closely you’ll feel the ocean spray on your face as you ride. Welcome to Parc national Tursujuq—Nunavik’s newest and largest park. At more than 26,000 square kilometres, this preserve on the edge of Hudson Bay can seem a bit daunting. So let an experienced local guide show you the way. Travel for nine days, starting with a kayak trip on one of the largest lakes in Quebec. Spot 4,000-year-old archeological sites. Boat along the wild Hudson Bay coast. Watch for Arctic wildlife. Revel at thunderous Nastapoka Falls. Photograph the Northern Lights. And connect with the landscape and the people who call it home. How long you’ll spend in New Brunswick’s first national park is up to you—but start with at least an overnight. There are three front-country campgrounds, eight backcountry campsites, two rustic cabins, five yurts and one cabin that’s shaped like a teardrop—but the best option might be the 30 oTENTiks. 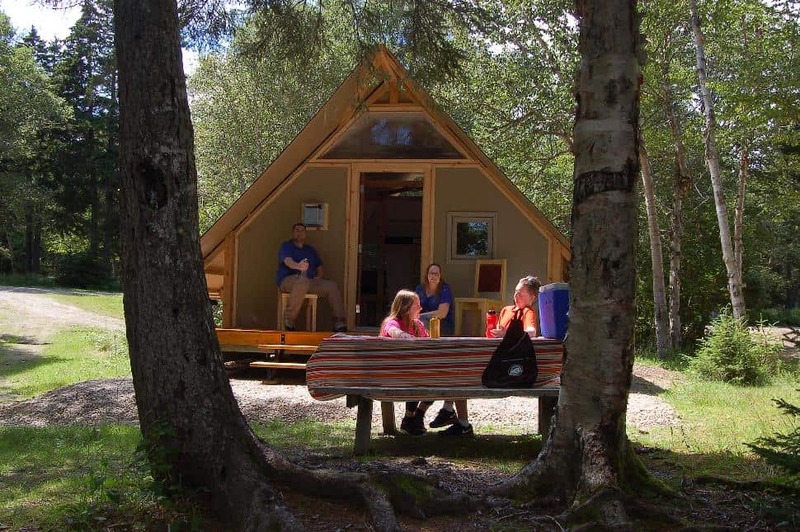 Think of a mix between a cabin and a tent and you’ll have an idea of what these units offer. Just bring sleeping bags, food and something to cook with and Parks Canada will set up the rest. Fundy National Park is a Dark Sky Preserve, which is the main reason to stay a night in its woodsy splendor. Atlantic salmon are often regarded as the king of fish—not simply because of their beauty and elusiveness, but because they are hard-fighting and a challenge to bring to the net. New Brunswick’s Miramichi River is perhaps the most iconic Atlantic salmon fishery in Canada. So where better to wet a line? Home to about 15 public pools, anglers flock to these waters with a fly rod in hand. It may take you a day, a week or a lifetime to actually hook one—but when you do, you’ll have achieved a special status as an angler. Welcome to the Atlantic Salmon Club. 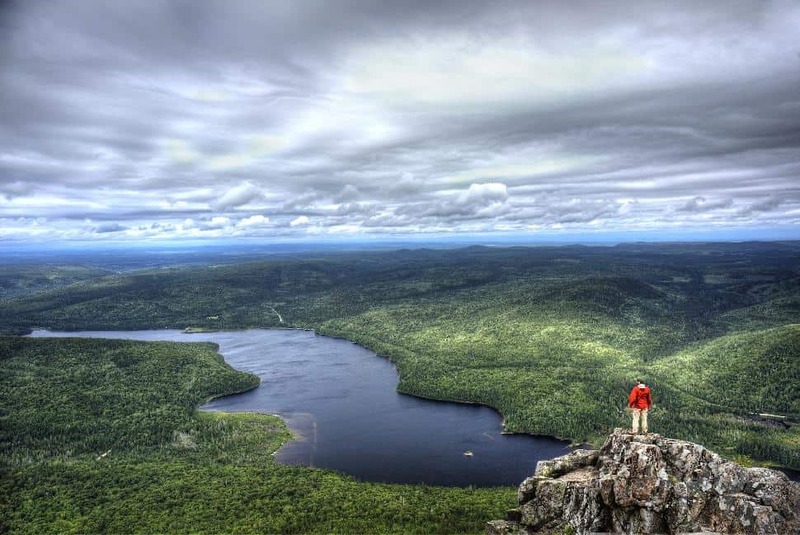 Set amid 1,700 square kilometres of Acadian woodlands and the continent’s oldest mountains, Mount Carleton offers a boundless view atop its namesake provincial park, stretching to nearby Mount Sagamook and Mount Head. The 10-kilometre, 820-vertical-metre trail presents an intermediate-level challenge, and the peak is adorned with an old fire tower. Two trail options lead from the parking lot to the top; make this summit-hike a loop for a change of scenery on the return jaunt. From the top of 355-metre Mackenzie Mountain, Fishing Cove Trail winds through mixed-woods forest alongside the Fishing Cove River en route to Cape Breton Highlands National Park’s only designated wilderness campsite. 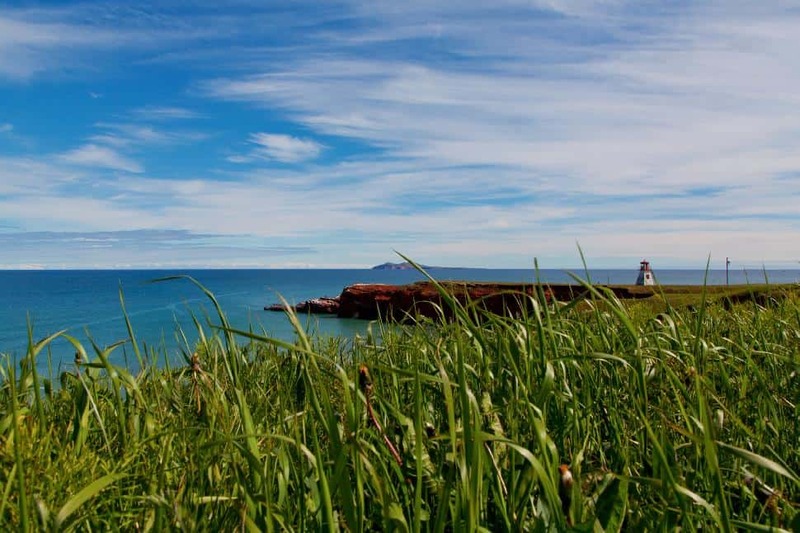 On a clearing next to a serene ocean bay and pebble beach (once home to a Scottish fishing village), set up your tent for a pleasant overnight while you explore the beaches and inlets of the Cape Breton coastline. You’ll need to pack in your own water, as well as a camp stove, as fires are not permitted. There are effectively three options for tackling this trail: a six-kilometre or 12-kilometre trail, both returning the way they came, or an 18-kilometre route, but this will require two vehicles (one parked at each lot), as it is linear. 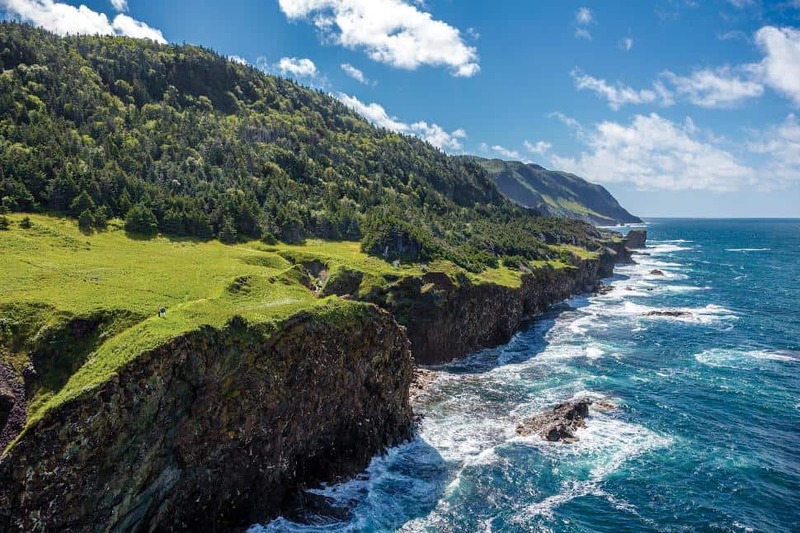 Green Gardens Trail offers arguably the best overview of Gros Morne National Park’s dramatic and varied terrain. There are two options to hike it. The more popular hike starts at the Long Pond Trailhead (nine kilometres return); the more challenging route—you will have to make two stream crossings—begins at the Wallace Brook Trailhead (16 kilometres return). Green Gardens opens with the barren Tablelands before winding through boreal forest en route to the volcanically-shaped coastline Gros Morne is famous for. Sea stacks and jagged cliffs border the Gulf of St. Lawrence, as do fields of wildflowers with the occasional grazing sheep, shepherded by local farmers. Located on the northwestern tip of Newfoundland, L’Anse aux Meadows does double-adventure-duty. Most notably, it contains the ruins of a 1,000-year-old Viking settlement; a discovery which re-wrote the history of European colonization. Plus, it’s also a prime viewing spot for the icebergs that oat by every spring and summer. 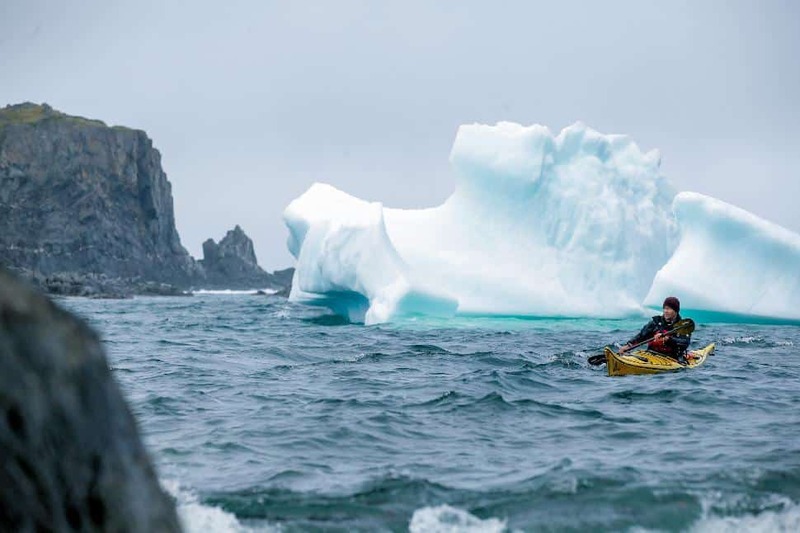 Rent a kayak at the nearby town of St. Anthony for a closer look at these icy leviathans, along with puffins, whales and rugged Atlantic coastline. It’s funny how things can hide in plain sight. Even though the fossils at Mistaken Point Ecological Reserve, located at the southeastern tip of Newfoundland’s Avalon Peninsula, have been there for half-a-billion years, they were only discovered relatively recently. 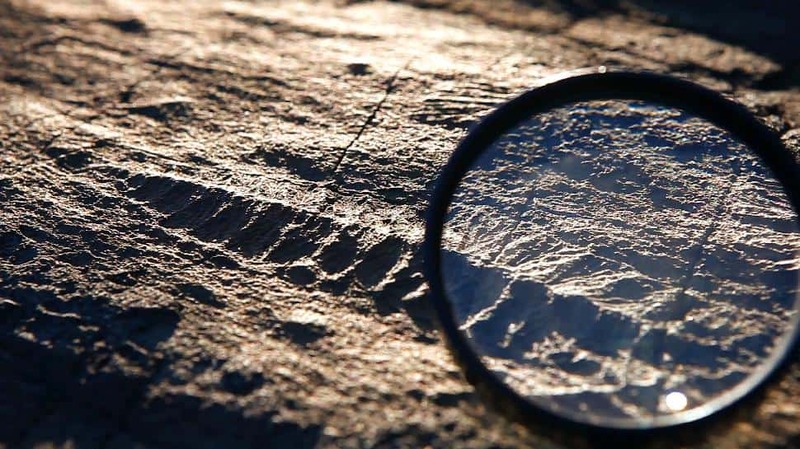 Once it was determined these fossils display the remains of the oldest complex life forms ever to exist on Earth, the area became a designated UNESCO World Heritage Site. Called Ediacara biota, these creatures lived on the bottom of the ocean between 575 and 542 million years ago—but are viewable to anyone who reserves a spot on the daily guided tours today. Each summer, a small community is established on the edge of Torngat Mountains National Park in Labrador. Inuit elders and youth from Nunatsiavut and Nunavik come together with visitors, researchers and Parks Canada staff to connect with their homeland. This is Torngat Mountains Base Camp and Research Station—a place for those who want to explore a unique landscape and experience the rhythm of a traditional way of life. Explore fiords and hike across some of Canada’s most remote tundra—spotting polar bears and learning of the vibrant Arctic ecosystem and traditional peoples of the land. Auyuittuq National Park impresses with 19,000 square-kilometres of high Arctic terrain. 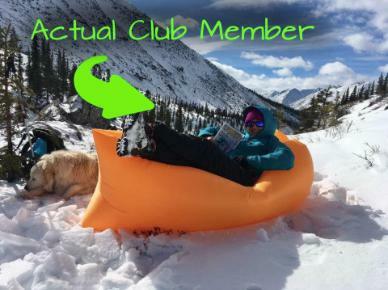 Some choose to explore the winter wilds; others visit during summer for multi-day treks. Unlike some of the North’s other parks, Auyuittuq doesn’t require a charter flight: just catch a scheduled flight to Pangnirtung then arrange a boat ride up Pangnirtung Fiord and into the park. 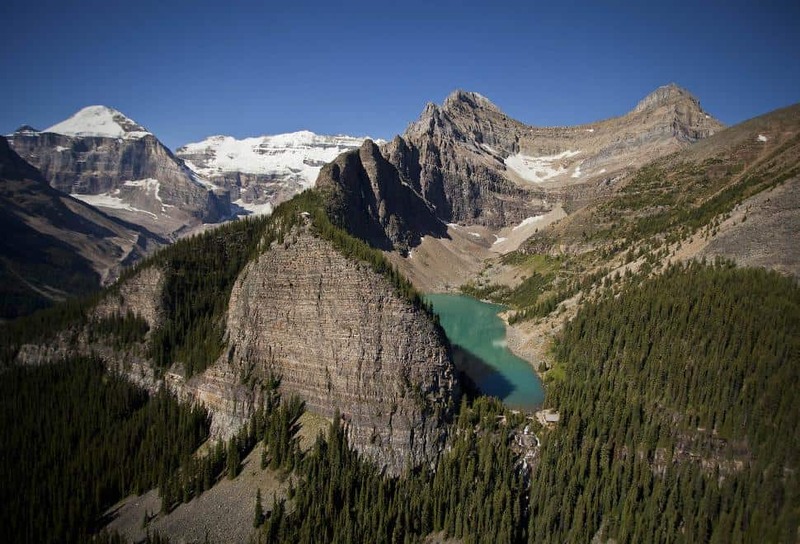 For summer hiking, Akshayuk Pass is the most popular route in the park—if the word “popular” can be applied—a 10-day, 97-kilometre trek that carves between imposing peaks and permanent icefields. In all seasons, you’ll be awed by mountains such as Overlord, Asgard and Thor—which appear, well, godlike. 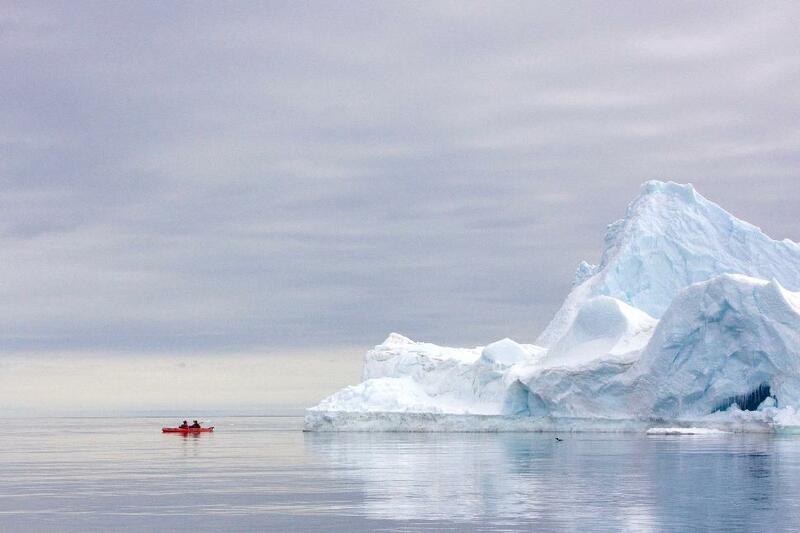 You’ll need to gather up some courage to take a dip in some of the coldest waters on Earth. There is no single place to swim in the Arctic Ocean—but Iqaluit might be the most accessible. Bonus points for setting foot in Coronation Gulf, the Northwest Passage or anywhere north of Baffin Island. Add this to a dip in the Pacific and Atlantic oceans and you’ll have a Canadian swimming trifecta. As the sun rises after weeks hidden below the horizon, the Arctic landscape quickly begins to change. Soon, round-the-clock daylight causes sea-ice to shear off in giant chunks, revealing the ocean below. Shorebirds black-out the sky. Whales froth the water. Polar bears swim impossibly far offshore. Welcome to the floe edge—one of the most exciting spectacles on the planet. Once the domain only of intrepid Inuit hunters or extreme adventurers, nowadays tour operators can take even folks with limited experience (but some extra funds) north of 70 degrees to camp for days alongside the newly formed floe edge. At 44,807 square kilometres, Wood Buffalo National Park isn’t just big. It’s bigger than Switzerland. It’s bigger than Denmark. It’s twice as big as Belize. So when it became a Dark Sky Preserve in 2013, it also became the world’s largest Dark Sky Preserve. Imagine the stars you’ll be able to see within what is the equivalent of an entire country without artificial light. Bonus—the park is in one of the best Northern Lights viewing area on the planet too. August and September are prime seasons for star-gazing, when the sky is dark and vibrant, but the weather is still warm. Though most of the park is in Alberta, park headquarters are in Fort Smith, Northwest Territories—also the best area to access this massive landscape. Lotus Flower Tower, Mount Proboscis, Middle Huey Spire. If you’re an alpinist, you likely know exactly what these names reference. 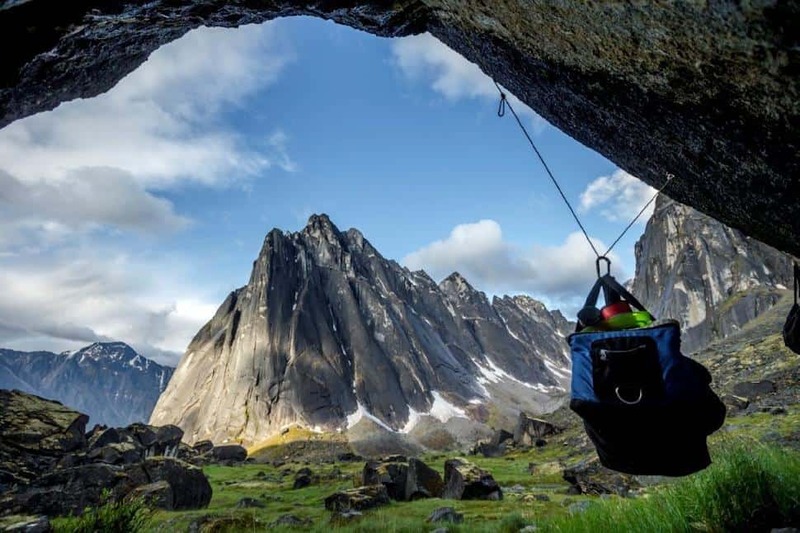 For the rest of us—they’re part of the Cirque of Unclimbables, a ragged mountain range and a hallmark of Nahʔą Dehé (Nahanni National Park Reserve). Will you hike in and camp beneath in the shadows of these impressive monoliths, or do you have the skills to actually climb the Unclimbables? 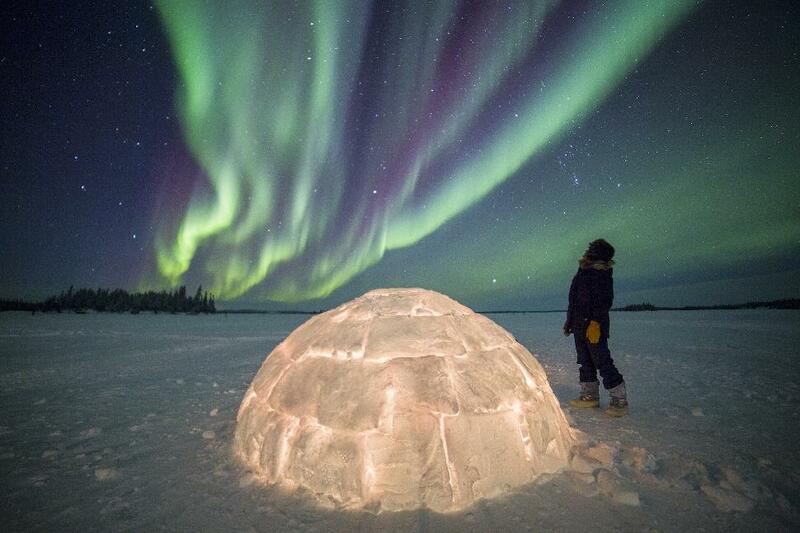 Yellowknife, capital of the Northwest Territories, is the best place on Earth to spot the Northern Lights. The reasons are simple—Yellowknife is easy to access, is home to dark and clear winter night skies and it’s also set directly below the ring of aurora activity that orbits the Earth. 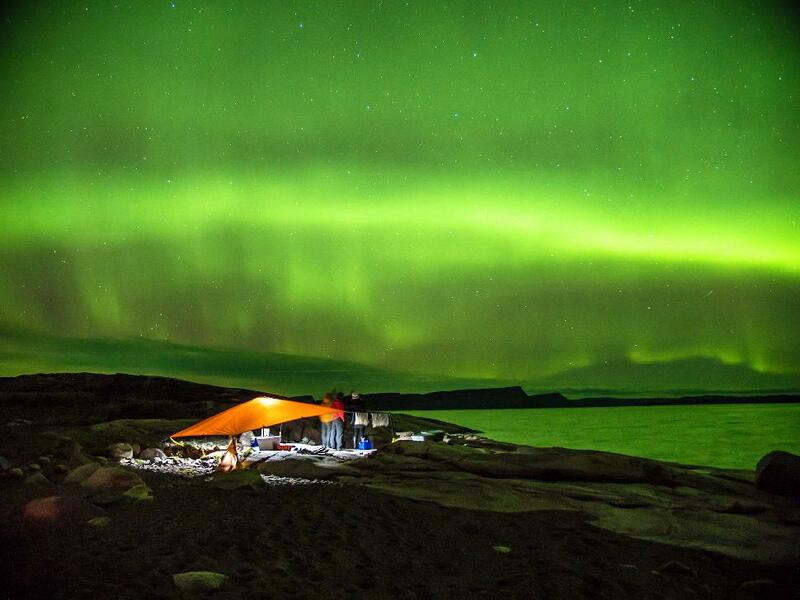 In fact, Yellowknife boasts more than 200 nights of aurora activity per year. If the sky is clear and dark, chances are you’ll see this impressive spectacle. Tours range from luxury heated teepees, to adventurous dogsled excursions, to self-guided snowshoe explorations. Kluane National Park is legendary. But few Canadians actually visit this 22,000-square-kilometre natural showcase—illustrated by the crowd-free hiking within. Lush valleys, impressive icefields—the largest outside of the poles—dense evergreen forests and tall mountains (including Mount Logan, Canada’s highest) characterize this expansive preserve. Pitch a tent at serene Kathleen Lake Campground and hike 16-kilometre Auriol Trail your first day, then explore outward from there. For more of a challenge, try the Ä’äy Chù/Slim’s River West/East or Observation Mountain Plateau trails. This is the North’s quintessential rafting experience. Rafting the Tatshenshini and Alsek rivers will take you through Yukon, into British Columbia and even right across the border to Alaska. You’ll immerse in the world’s largest protected biosphere and raft in the shadow of some of the planet’s most daunting glaciers. You’ll see wildlife on the shoreline and learn about how this is actually one of the most seismically active places in North America. You’ll view landscapes that conjure up the peaks of the Himalayas. And you’ll leave with no doubt why this multi-day rafting experience is one of the most renowned adventures in the world. The lengthy Yukon River offers arguably the best introduction to northern canoe tripping. It’s mostly calm, with a few mild rapids to navigate, and there is plenty to see and do along the way. It’s like a Klondike highlight reel—with First Nations historical sites, Gold Rush history, vast tracts of wilderness and plentiful wildlife. 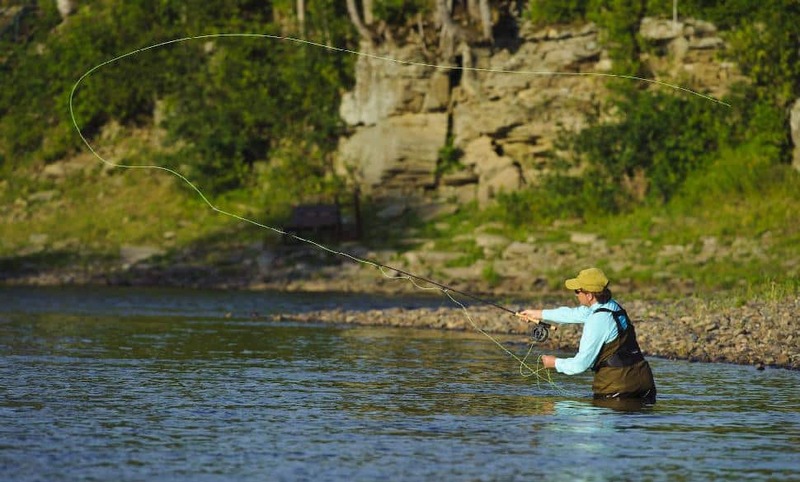 A highlight will be visiting Fort Selkirk—the Gold Rush town—or perhaps fly fishing for Arctic grayling as the midnight sun traces the horizon. Herschel Island, in Qijiqtaruk Territorial Park, brings together natural and cultural exploration in fantastic unison. Though home to a wide variety of Arctic flora and fauna—including the largest colony of black guillemots in the region—Herschel Island is best known as the former site of a whaling camp. Ruins from this bygone area—including several structures— can still be viewed. There is also a multi-millennium of Aboriginal history, as the Inuvialuit have used this small island for subsistence purposes since time immemorial. Visits are usually in the form of fly-in daytrips from Inuvik, Northwest Territories, operating during July and August. Protecting more than 10,000 square kilometres of land at the northern tip of Yukon, Ivvavik is Canada’s first national park to be formed under an Aboriginal land agreement. And since 2012, it’s been home to one of the most accessible Arctic hiking adventures in Canada. 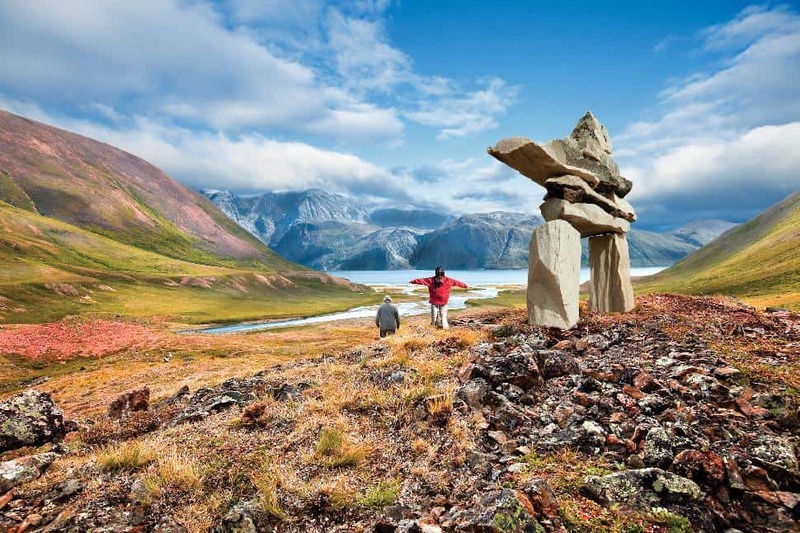 From June to August annually, Parks Canada operates a fly-in basecamp alongside remote Sheep Creek, deep within the park, hosting groups of eight on a trip that merges rich nature and Inuvialuit culture under the midnight sun. 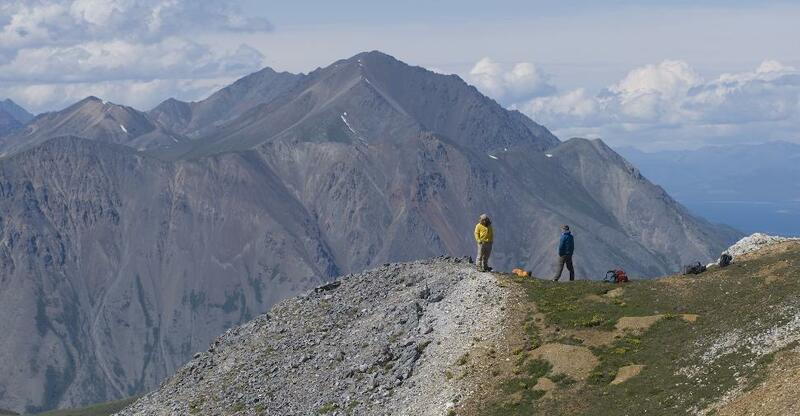 The peak adventure is the Halfway to Heaven hike—a daylong route that winds through the tundra and over ridgelines to the 800-metre summit of a remote peak tipped with the park’s signature tors. These 52 adventures are just the start. 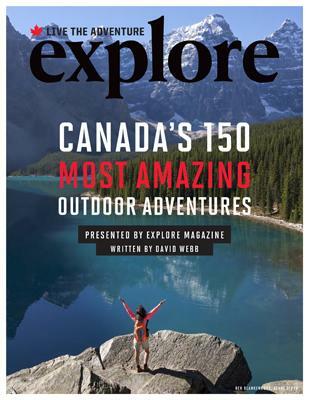 Get more information on these plus 98 MORE amazing outdoor adventures in our brand-new, totally free e-book: CANADA'S 150 MOST AMAZING OUTDOOR ADVENTURES. You're not going to want to miss this limited time offer. "What Kind of Adventurer Are You?" 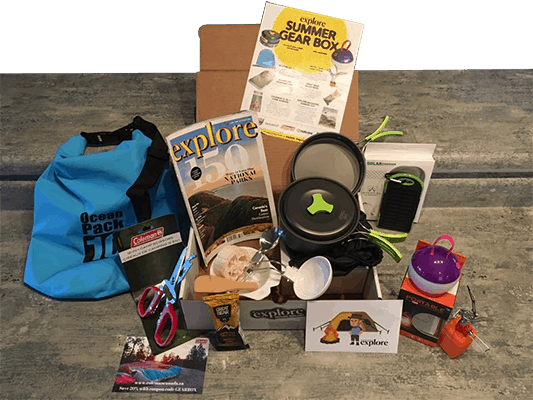 Do You Have The Gear For These Adventures? Does the lone wolf within you want for untouched, crowd-free parkland? Whether you need these tips for yourself or for your reluctant partner—read on to discover 10 ways to hike further and faster and have more fun than ever before.